I have been roleplaying for long time. I have been a Star Wars fan for far longer. The very first role playing manual I ever read was West End Games' Heir to the Empire Sourcebook - this was before I’d even heard of D&D. At the time I thought it was the most amazing collection of supplementary information and images ever, but I wondered what the numbers were all about and what the heck a d6 was. 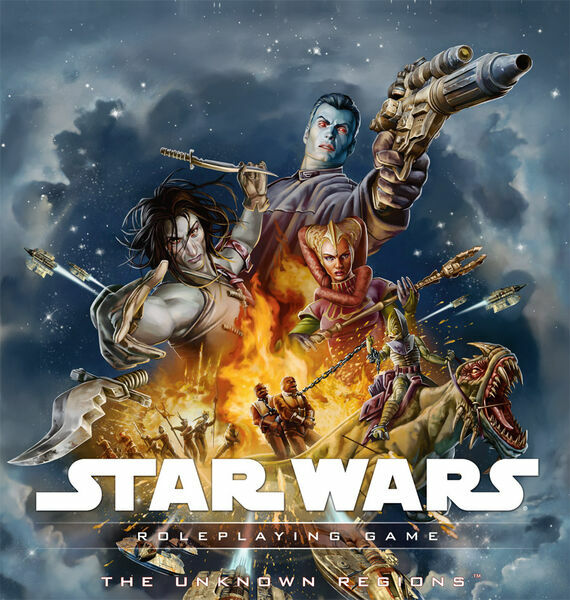 I didn't encounter another Star Wars RPG manual until my waning days of high school with WOTC's Revised Core Rules version of Star Wars - an absolute mess of a game. The rules weren't just a port of 3.5 D&D, they were awkward, poorly explained and virtually all the material presented had a strongly slanted bias toward content from the prequel trilogy. I read it, never played it, and watched it slowly slide into obscurity over a few years. Then, in 2007, Saga Edition was released with much fanfare. And this game was amazingly well put together. It looked at all the problems of the previous game and addressed them, trimming the fat off the game; making it run incredibly smoothly. The game also looked at the feel of the movies and did everything it could to make a d20 game feel like the films. Combat was simplified and pushed into a more high-flying, swashbuckling style. Character classes and prestige classes were cut down to the bare minimum required, while simultaneously making character creation more flexible by offering a wide variety of free-form talent trees and lowering restrictions on multi-classing. Saga managed to make having less feel like a lot more. Following the core release was the most impressive line-up of supplements seen since WEG's d6 Star Wars game. he class-specific splatbooks not only gave a lot of crunchy details for their respective classes, they were also an amazing resource for Game Masters looking to run a campaign focuses on a specific class. This was something that is generally lacking in most games' splat material. The setting guides were equally fantastic. WOTC's previous attempts at working with Lucasfilm led to a lot of attention on prequel-era content. In an attempt to be neutral to the series timeline and the cross-promotion requirements made by Lucas, prominent prequel planets such as Coruscant or Geonosis were often made the focus, to the detriment of the entire line. Saga's setting books obeyed the letter of these licensing requirements, but they also managed to include related material from the entire breadth of the franchise. So, while The Force Unleashed Guide did have a lot of material from the TFU videogame, it also managed to bring in a so many ideas and content from other videogames and comics from around the same time period that it may as well have been the Dark Times Guide. That being said, while less felt like more in the new rules, less definitely felt like less in supplemental material. Most books could have used a longer page count. In particular, Threats of the Galaxy should have been one hundred pages longer, including a few index pages. Something I don’t mention in reviews of games is the community support and fan content for game. However as this is a retrospective and I don’t have any self-imposed rules for these yet, I’ll just say that the Order 66 Podcast was an astounding resource for rules-clarification, character optimization ideas, designer interviews and morning zoo-style antics. Overall, it’s an awesome resource and enjoyable listening experience. From that podcast's community we got saga-edition.com, a collection of fan-created weapons, starships, npcs, races, feats and talent trees, all as well designed as the professionally created material. I’m not trying to say the game was flawless, because nothing is. What I am saying is that in many aspects it was exceptional and its publishers didn't give it the fairest of shakes. I wish there was more of it and that the next iteration of this franchise in RPGs can be just as good.